At MDC Electric we pride ourselves on hard work, honesty, and integrity to reveal excellent customer service. We are fully committed to getting the job done safely, no matter the challenge. With so many good and qualified electricians in the construction industry, how does one separate the extraordinary from the ordinary? It’s quite simple really. We stand out because we keep our promises, are firm believers in quality, and above all we want to provide the safest electrician services for you and your family. We take care of you from start to finish, so that you have peace of mind and enjoy the results. We proudly offer a personalized approach for each individual client, not only benefiting from our electrical service, but also providing information and resources to help for a sustainable future. Our straight-forward flat-rate pricing is designed to help you, the customer, know your investment before we begin. This up-front pricing helps ensure that you get the best value and efficient service every time. MDC Electric is a fully licensed and insured electrical contractor with the Electrical Safety Authority. We take great pride in offering exceptional electrical services to residents from Toronto to Barrie. If you are looking for an honest, reliable, and affordable electrician in Newmarket, or throughout York Region, call us first, we guarantee you will not be disappointed. Call us when it comes to small jobs such as installing ceiling fans or adding receptacles. Whether you want to hook up a new oven, change a light fixture, or even just upgrading a switch to a dimmer, sometimes you are better off leaving it to the professionals. We specialize in small household electrical jobs that most people just may not be comfortable doing themselves. 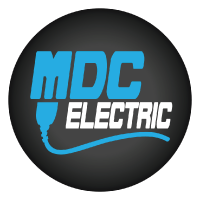 Whether you need a car charger receptacle, Tesla Wall Connector or Level 2 charger installed, MDC Electric has you covered. MDC Electric is an approved and Certified Tesla Electrician. We offer tailored car charger installation services to suite your needs. We know you are excited to get your new car and we are here to make your transition to going green a quick and painless process. If you are having any kind of electrical difficulty such as tripped breakers or flickering lights, this indicates a problem with your electrical system. You should have it professionally inspected and repaired. Electricity can be extremely hazardous if you are not qualified to work with it. Call MDC Electric to safely troubleshoot your electrical problems. Electrical safety is our top priority. Home inspections and pro-active initiative from the home insurance companies have required homeowners to have their homes inspected by the Electrical Safety Authority. ESA is a provincial governing body that promotes electrical safety through awareness and through inspection services. MDC Electric is an Approved Electrical Contractor with ESA and can help you set up your inspection with ESA. We will correct any deficiencies that the inspector may find. If you are having any kind of electrical difficulty such as tripped breakers or flickering lights, this indicates a problem with your electrical system. You should have it professionally inspected and repaired. Electricity can be extremely hazardous if you are not qualified to work with it. Call MDC Electric to safely troubleshoot your electrical problems. Electrical safety in your home is our top priority. The electrical panel is the core of your electrical system. This is where your home receives electricity from the utility company. The power is then distributed throughout your entire home until every outlet and light has the power that it needs. MDC Electric can change that old fuse box panel to a new circuit breaker panel or upgrade your existing breaker panel to supply more power for your needs. All of our work is ESA certified and inspected. GFCI Outlets – What Are They? What Makes Them Important? When it come’s to your home’s electrical system, do you really want just anybody tinkering with the wires behind your walls? Hiring a Licensed Electrical Contractor (LEC) is not only the law, it’s your safest choice. I would like to express the importance for residents of Ontario to have functioning smoke alarms on every floor of their home and in sleeping areas. A fatal fire in Brampton, Ontario on Tuesday, Feb 14 took the lives of three people — This left an 8 year old child badly burnt and without a family. It was confirmed that the Brampton home had no working smoke alarms.